So my boy asks me to quiz him for a history test. French Revolution. Ah, triggered by a sovereign debt crisis. The Church, largest land holder and a major political force alongside the soon to be headless King, gets its property expropriated to cover new bonds - “stolen” according to my son (at that point ignorant the Church was exempt from tax and allowed to extract 10% per annum on revenue from the faithful - God's work, don't you know). dictatorship-> ill-conceived adventure in Russia etc etc. Course, the Church eventually was legally written out of state matters entirely in 1905. Not that verses of the history aren't reprised down the ages. In all sorts of contexts. The Church played a larger role in society back then by virtually running all the hospitals, schools, universities, and orphanages. The State did little in any of these areas. Certainly the Church played a larger role; and had done in France for near 800 years. It was by 1789 the First Estate of the Etats Généraux. Justifying the accumulated priviledges (like the tithe) of this long tenure by citing one's responsibilities (health, schools etc) is perfectly understandable. But how extensively those responsibilities were undertaken is debateable - it would be a stretch to suggest the Church was a model provisioner of social welfare in pre Revolutionary France. But the broad point here is not an anti-Church one. It is that political power concentrated in too few institutions is socially corrosive - be those institutions religious in nature. Or financial. I recently read of a brilliant scoundrel, genius and convicted murderer, a Scotsman named John Law. 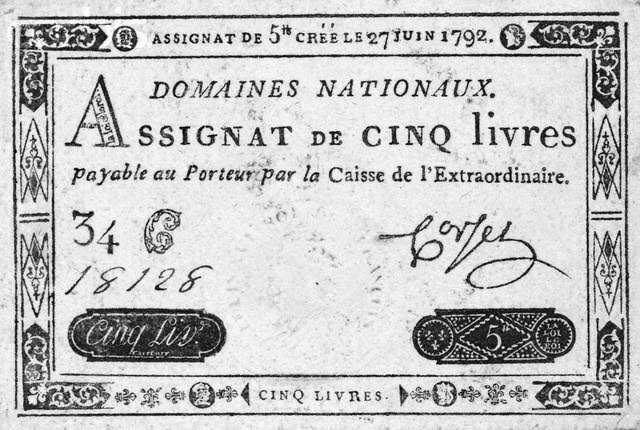 As I understand it,fled to the Netherlands, observing the novel and unique stock exchange evolution there, and then he singlehandedly took over the finances of France (you have to read the book to understand how he did this) in the early 1700's under Louis XIV. According to Prof. Niall Ferguson in his book, "The Ascent of Money", Law managed to essentially man empowered to runn the French financial system as if he were simultaneoulsy running "all five hundred of the top US corporations, the US Treasury and the Federal Reserve System". In a nutshell, the result was massive inflation and economic chaos, which Ferguson seems to suggest eventually led to the horrendous economic conditions of the French State even up to the time of the French revolution. Very interesting read. Sorry above comment should have read "Law managed to essentially become empowered to run..."